There are a number of advantages to rose gardening in containers. First of all, anyone can try their hand at rose gardening by using containers. 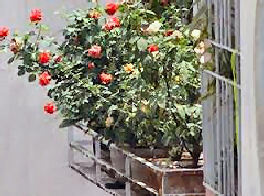 Even if your gardening area is limited to a small balcony as in the picture to the right, you can still grow roses. Enjoy them through the window, smell their lovely scent from indoors and cut them for display on your dining table. For all gardeners, rose gardening in containers is easier. 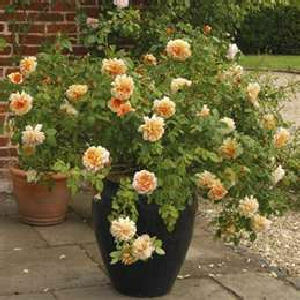 Pots can be moved around to find out which exposure, in terms of sun and shade, best suits the rose. You can bring your roses up close – to your deck, patio or porch where you relax or entertain – enjoy their beauty and marvelous scents. Concerns about freezing weather, or storms with hail, can be solved by moving the pot into a sheltered area. Treatment for pests or diseases is generally easier, since the rose can be isolated from the rest of your plantings for necessary treatment. Rose gardening in containers is a pleasure. Don’t you love roses? I love their smells and their blooms but I never had a whole lot of luck growing them. Growing roses in containers has helped because the plants are in an area where I tend them more easily and promptly. Except for large climbing roses, most roses can be grown in containers. From miniature roses to those that grow to five feet tall or wide, roses can be successfully grown in a pot. It needs to be larger to accommodate their root systems, and they need good soil, good drainage and a location with enough sunlight and air circulation. When rose gardening in containers, any kind of material will work, but if you choose plastic containers, use light colored ones. They won’t heat up as quickly in hot weather. Clay pots actually keep the roots cooler, but there is a danger of cracking in colder temperatures. 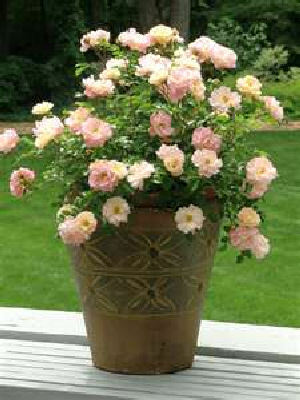 To accommodate a hybrid tea rose, large floribunda, grandiflora or shrub rose, a 15 gallon pot is best. A small floribunda would do fine in a 10 gallon container, while most miniatures fit well in 4 or 5 gallon size. When it’s time to transplant, move to a container one or two sizes larger. Roses need some air that moves. Space containers about 2 feet apart. This keeps the possibility of fungus disease down. Roses also need full sun, at least 6 to 8 hours per day. 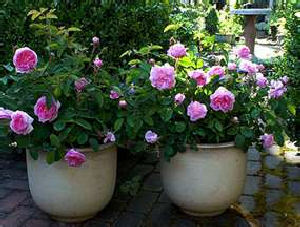 Rose gardening in containers started with rose standards and miniature roses only. Rose standards are easy to grow in containers. A “standard” is a plant that has been shaped and trained to grow like a tree. Under plant the rose with fillers and vining or trailing plants for extra impact. 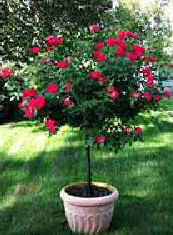 Now, miniature roses, hybrid tea roses, shrub and bush roses can all be successfully grown in container gardens. The only rose that doesn’t do well in containers is a large climbing rose. 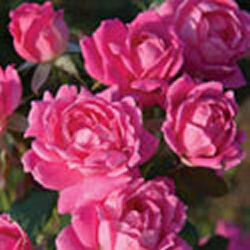 This David Austen rose is only one of many varieties of roses available for container planting. 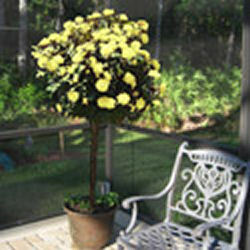 Shrub roses are wonderful for container gardens. They mound and are generally just the right size for pots or boxes. My favorite shrub rose is the Knockout variety. Rose gardening in containers with these roses will sell you on growing roses. They are easy to grow and were developed to resist disease. They grow to 3 feet or so in height and spread which makes it great for containers. With a little care, these roses will bloom all season. See more about Knockout roses. Get your container ready. Place a layer of gravel or rocks about an inch deep in the bottom of the bottom. This helps drainage and prevents the soil from compacting at the bottom of the container. Prepare the soil. Use equal parts of good quality potting soil, aged garden compost and well-composted mushroom or steer manure. If you con’t have garden compost, use more potting soil. Add a cup of perlite to the mix to aid drainage. Add a cup of bonemeal to the soil. You can also use fishmeal to increase nutrients in the soil. Fill the container about 2/3 full with the potting mix. Place the rose, spreading its roots out over the soil. Fill in around the rose with the rest of the soil and press down gently and firmly around the canes. The surface of the soil should be level with the top of the root ball – where the stems start to branch up and out from the root ball. Water so that the soil and roots are saturated. Rose gardening in containers will require more watering than growing roses in the ground. Check for dryness about an inch down into the soil. When it is totally dry, water thoroughly. In places with mild temperatures, roses can live their lifetime in a container. If you are like me, and have cold winters with months of freezing temperatures, at least at night, you can move your roses inside to an unheated garage or shed – somewhere that is sheltered and the temperature will stay above freezing. Roses are naturally dormant in the winter – they don’t grow or bloom then so you want to keep them somewhere pretty cool. I was advised to wait until the rose became naturally dormant – leave it outside – until the first hard freeze is forecast. Take it inside then, but not while temps are still warm. You don’t need to water your roses regularly during the winter months, but do keep the soil from completely drying out. I put some water on mine maybe once a month and they do fine. In spring, bring the rose containers back outside. Feed the plant with a tablespoon of Epsom salts sprinkled around the base of the plant to encourage healthy foliage. An application of fish emulsion food will also give them a good start in the spring. Taking care of roses is different in some ways than growing them in the ground. One obvious difference is frequency of watering. Because it is essential to provide fast drainage the soil can dry out very quickly. Daily watering is necessary in hot weather. Smaller pots may need to be watered twice daily during very hot spells. Frequent watering means fertilizer will leach out of the soil quickly, so fertilizing will be needed more often. Every three years or so, change the soil in the container. A buildup of salts left by the fertilizer needs to be removed. When you change the soil, check the roots, and if they are bound up, trim them back. Rose gardening in containers offers some real advantages if you are running short of garden space, or if you find that working at ground level has become too challenging, or if you simply want to experiment with an easily changed garden design featuring new roses.